Internationally known choreographer Christopher Wheeldon did when asked by Joffrey Ballet Artistic Director Ashley Wheater for a re-imagined ballet that still incorporated some of the beloved images that fit Tchaikovsky masterpiece. Add in Julian Crouch’s magical and wondrous set and costumes and a new book by Brian Selznick that is wordless yet evocatively descriptive, and audiences have an exciting, fresh story to go with Tchaikovsky’s music. 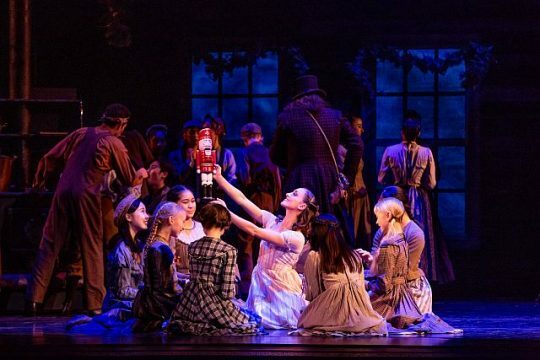 That audiences have bought into the new look and story The Joffrey premiered in December 2016 was evident by exuberant applause at the Dec. 1, 2018 opening of what is a continuing holiday tradition. New look aside, The Joffrey dancers continue to amaze as they execute Wheeldon’s choreography with grace, style and skill. What audiences might notice and relate to today’s immigration policies is that the show opens with vintage posters and newspapers including those on one paper saying that the large fair needs to hire more immigrants. In what is being called the “re-imagined” ‘Nutcracker,’ Marie’s family are working-class immigrants. The guests at their holiday party are also immigrants who likely work at the fair. In this new story, Marie’s mother is supposedly the sculptress for the fair’s large, golden statue based on the Statue of the Republic that was a fair attraction. What has stayed the same is that Marie’s brother, Franz, is still bratty and breaks the nutcracker, that there still is a magical visitor who in this story is the fair’s Grand Impressario, and that the mice still loom large and are taken on by toy soldiers. In Marie’s dream the Grand Impressario makes her family’s paltry fir turn into a growing, glowing, gorgeous tree. Some of the individual dance images are different but they also are splendid as they convey what Marie dreams will be in the fair when it opens. The old, traditional “Nutcracker” story is likely to continue in stories put on by dance groups everywhere. 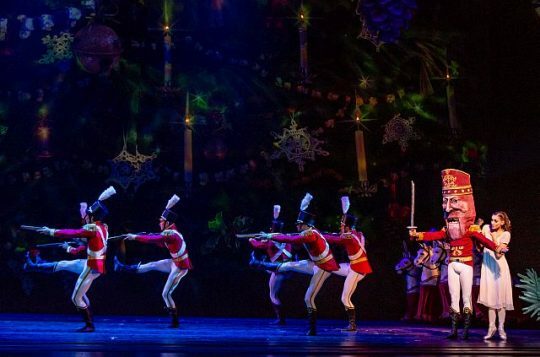 But the Joffrey’s new “Nutcracker” is delightfully fresh, beautifully performed and artistically presented. 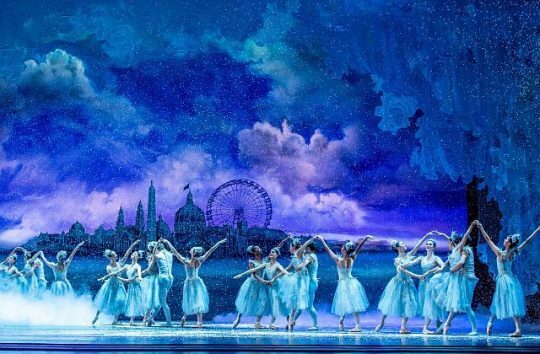 DETAILS: The Joffrey Ballet’s “The Nutcracker” is at the Auditorium Theatre of Roosevelt University, 50 East Congress Parkway, through Dec. 30, 2018. Running time: 2 hours with one intermission. For tickets and other information visit The Joffrey.